Utopia consists of an outcrop of rock with large boulders, creating a reef-like feature that sticks up from the surrounding sediments east of Bembridge and south-west of Selsey. This rocky reef supports rich communities of sponges and anthozoans. Anthozoans are a group of soft animals with feathery tentacles, which includes soft corals, sea-fans, cup corals and anemones. The reef is surrounded by sediment made up mostly of gravel and sand. The animals that live in Utopia MCZ are mainly large, slow growing species such as branching sponges which provide hiding places for small fish, crabs and prawns. It is also an important area for many shark species such as tope and smoothhounds. Utopia was designated within the second tranche of MCZ sites in January 2016. The small inshore site measures 2.7km2 and is located approximately 10km south of Selsey Bill and 20km east of the Isle of Wight. DEFRA information, including MCZ factsheet and designation order with site boundary coordinates. Management has been developed by Sussex IFCA in close liaison with partner organisations and through public consultation. The management is defined in Schedule four within the MPA Byelaw. Formal consultation took place in September 2017 and the byelaw was signed off by the Secretary of State in July 2018. The MPA Byelaw can be found here. This is the over-arching MPA byelaw with Shedule one for Kingmere MCZ, Schedule two for Beachy Head West MCZ, Schedule three for Pagham Harbour MCZ and Schedule four for Utopia MCZ. The associated Utopia MCZ Schedule Impact Assessment can be found here. A leaflet summarising the managment of Utopia can be found here. These management measures are specific to Utopia MCZ. Other management measures may apply, check here. JNCC information about fragile sponge and anothozoan communities on subtidal rocky habitats is available here. Established animal communities are principally dominated by large, slow growing species such as branching sponges which provide hiding places for small fish, prawns and crabs. Sponges include the yellow stag horn sponge (Axinella dissimilis), a cup shaped sponge (Axinella infundibuliformis), an encrusting sponge (Hemimycale columella), a boring sponge (Cliona celata), and the golf ball sponge (Tethya aurantium). Hydroids also grow on the reef. These look a bit like seaweed or feathery sticks but are in fact animals related to jellyfish. They are made up of colonies of tiny animals called polyps. Some polyps are specialised for feeding whilst other perform a reproductive function. Hydroids include the sea beard (Nemertesia antennina) and the similar Nemertesia ramosa. Bryozoans also look a bit like seaweed but are colonial animals. Individuals are known as zooids. Some are specialised to feed, others for defence or reproduction. Bryozoans include the ross coral (Pentapora foliacea) and sea chervil (Alcyonidium diaphanum). Sea chervil can cause a rash which fishermen call ‘Dogger Bank itch’. Sea squirts also live on the reef, such as the light bulb sea squirt (Clavelina lepadiformis) and orange sea grapes (Stolonica socialis). Sea squirts, or tunicates as they are also known, have a spinal cord when they are in their larval stage but they lose this as they develop their more simple adult body. Areas of deep sediment deposits, consisting mainly of sand and gravel, surround the reef. To see more information on the habitats and video clips of seabed surveys click here for our interactive map. The site is also an important area for various shark species, including tope and smooth hounds. Tope are a slender species of shark, that can grow up to two metres long and are classified as ‘vulnerable’ under the IUCN Red List of Threatened Species. Data from the UK Shark Tagging Programme indicates that the area is a hotspot for tope. The site was named after this species. Like tope, smooth hounds give birth to live young. The mother shark carries the pups for nine to twelve months before giving birth in sheltered coastal areas. Smooth hounds do not reach reproductive maturity until they are 8-11 years old. This slow maturity, coupled with the small number of young they produce, makes them vulnerable to over fishing. Overall, there is very little fishing activity in Utopia MCZ. The main fishing types that do occur are angling and potting. Angling (rod and line) occurs all year round but particularly between April and September. Potting activity targets lobsters, crabs and whelks. No towed gear fishing occurs in the site. In 2012, there was a DEFRA funded survey to find out more about the features of the site before it was designated. They used a drop down video camera to look at the habitats and the species living there. You can read the report here. In 2017 volunteer divers conducted a survey in Utopia under the SeaSearch programme. You can read their report here. 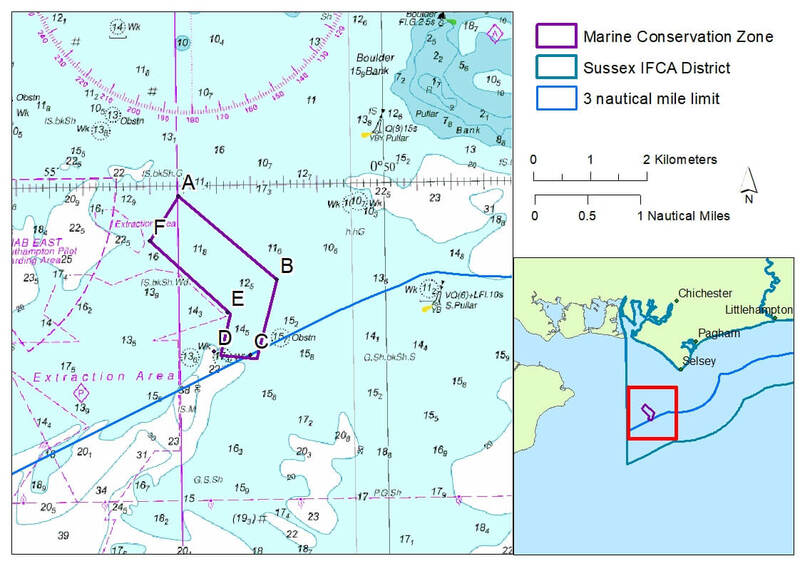 Since 2001, when Sussex IFCA officers are conducting a sea patrol and they see a fishing vessel, they record its position and the fishing gear it is using. Fishing activity in and around Utopia MCZ was analysed to understand the fishing pressure on the features. A report on the fishing effort for the whole district is available here. The summary of responses from Defra’s consultation on tranche 2 MCZ sites between January and April 2015, outlined that the main issue raised in relation to the Utopia MCZ site was from the aggregates industry with regards to the low estimated costs provided. Two requests to amend the boundary of the site to include a buffer zone around the MCZ were also submitted and concerns raised regarding anchoring management. In spring 2017, all fishers known to utilise the site and the vicinity were contacted directly by IFCA officers to better understand site use. Two informal consultation drop-in sessions were held in June 2017 for recreational anglers and commercial fishers. The attendees were offered information on the proposed management measures and invited to comment. Feedback was also sought from all members of the Sussex Marine and Coastal Forum, which comprises representatives from a range of organisations involved in the local marine environment, including NGOs, conservation bodies and local authorities. The responses were taken into account during development of the management.